For new year this year I thought it would be fun to mix two of my favourite things, parties, and throwback. Last year I threw a James Bond Casino royal style party and it was so much fun. I always thought themed parties were incredibly cheesy…and yes…they are…but they are also so FUN and who doesn’t love a bit of cheese anyway?! This year I wanted to do something different, I am the youngest of four children and my two brothers, and sister grew up in the 1970’s/1980’s so I thought we’d throw it back to their childhood and teenage years. In collaboration with my most wonderful Truffle Shuffle who just so happen to be all things 70’s/80’s related I thought this would be the absolute best idea. I went all out with the rainbow decorations, glow sticks, movie posters, bright balloons and photo booth props. We had some 1980’s themed party food and we all dressed up as our favourite movie character from the time too. I was born in 1995 so I guess I’m cheating a little but one of my favourite films is Grease which was released in 1978 so I went for Sandy and I LOVED IT. For my brother, he was a huge Back to the Future fan…so I picked out this gorgeous Delorean Car Key ring. The quality of this is insane! I mean I never underestimate Truffle Shuffle but for a Key ring this is amazing, it’s so heavy and well made and absolutely perfect for a BTTF fan! It’s made me want to watch all of the films again because let’s be honest…they are fab. 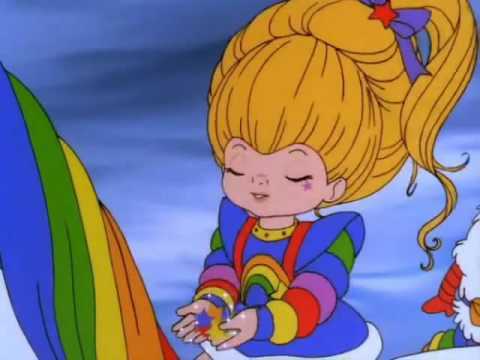 For my sister I picked this Rainbow Brite mug, she used to love Rainbow Brite and I remember she used to have a doll with shiny sleeves and a ribbon that I used to play with! Even looking at the pictures is giving me all the throwback vibes and I just love the bright colours. The design of the mug is so retro and lovely, it’s plain white background with the original drawings of the characters in rainbow order, the colours are slightly muted and pastel which looks gorgeous with the black outline and white background of the mug. I love the size of the TruffleShuffle mugs they are always such a good size mug, you know when you just want a proper cuppa…Truffle Shuffle have got your back. For my sister in-law I picked this gorgeous little Miffy Enamel Pin She absolutely loved Miffy, I gifted her a Miffy Tote bag for her birthday which she was so excited about so I thought this would be perfect to add to the collection. I love the simplicity of the Miffy products, the drawing and design is so cute and TruffleShuffle have such a fab range of Miffy products! For my Brother-in-law I chose these Pac Man socks I mean you can’t really go wrong with socks can you… especially ones with a childhood favourite game on them. These are suuuuch good quality, they’re nice and thick and also really soft and lovely, the pattern and colours are perfect and they just look so retro and fab. And for my mum I picked this Labyrinth tote bag. I remember when she introduced me to the Labyrinth movie as my sister had always loved it growing up and she knew I would too. It has to be one of my favourite films ever, it’s just brilliant and Truffle Shuffle stock some of the most amazing Labyrinth bits ever, including this amazing mug, and the best board game you’ve ever seen…which I might have to treat myself to in the new year! Throwing parties is literally one of my favourite things to do and this has to be one of my favourites to date, if you’re planning a party why not pick a theme? picking a year theme is so much fun especially for those who grew up in that time frame and gives them all the throwback vibes! Big thank you to TruffleShuffle for the gorgeous prizes, as always they came up absolute trumps and I couldn’t recommend them enough. I am totally in love with their site, everything they offer and all of the different exciting categories they have! Posted on January 9, 2019 by WhatEvieDidPosted in food, LifeStyleTagged 2019, 70s, 80s, backtothefuture, bag, celebrate, cocktails, delorean, disney, drinks, Gift, happynewyear, labyrinth, miffy, Mug, NewYear, pacman, party, partyfood, partytime, pin, prizes, rainbowbrite, socks, throwback, throwbackthursday, TruffleShuffle, win.